Mod The Sims - Have Some Personality Please! PANDORA SIMS stole one of my mods! Please read spoiler to see what you can do! Please don't support them. They steal other modders mods and then sell them. NEVER pay for my mods. They will always be free!. Please come to my sites only to download my content that way you know you will always get free up to date content. PANDORA SIMS even changed the name of my mod but it is mine. <--I added this to the Bladder Reliever Update that I did. These are my customizations of that mod. Boycot them. Cancel your account, stop downloading or visiting their site. The less traffic, the less downloads they get the lower they will get on the search engines. Encourage other modders that you know to take a stand by Send a DMCA to their Host, Send a DMCA to Patreon guidelines@patreon.com, Send DMCAs for each Link to Google HERE Each link needs to use a new group. The more DMCA's that are sent to good the farther down they will get on the search engine. Please Please help, not just for me but for all modders and all future modders out there. This has been an on going thing with them for years. This mod will bring more personality to your sims! Out of respect to me and any other modder you should not change something in their mod and upload it for others to download. It takes time on a mod regardless if its a core mod, script mod or just and XML mod. With all my mods so far, it takes time to go through the files, find what ones you want, decided where you want them, get them placed, make the necessary code changes, add new codes, and collect all of the loose ends to make even a XML mod to work properly. Plus with all mods regardless of their type, you have to test it, test test test over and over just to make sure you have all your codes in a row. Some of mine have enough code changes that I had to do a lot of trial and error just to find what ones I preferred and some had extra files that had to be tended to as well. So again: It is disrespectful, and hurtful to make even a small change in one code in any mod and upload for others to use. Any pack listed if you do NOT have it, this mod will NOT give you those interactions or items. Updated: 3/2/19<--Keep updated with changes! Always remove old files before adding new! REMOVED: Exchange numbers. Making this not autonomous because of a conflict with Scumbumbo's Unlisted Phone Numbers Mod doesn't make sense so I just removed it all together. The interaction is still restricted based on the vanilla game's settings so it won't mess up the Restricted Romance Add-On. CHANGED: Interactions: Fight, Yell At, Insult and Erase Memory. These have been toned down so let me know how they are working in your game. CHANGED: Sims Learn Info Add-On, I lowered the chance rate on learning a new trait in deep conversations. FIXED: Asking a sims career will now give you the sims career. Who knew you were supposed to learn their career the first time you asked! FIXED: Sims will no longer be able to be romantic with sims they have never met in the main mod. Thank You LittleMisSam for your 2nd pair of eyes seeing what I over looked. REMOVED: Walk in Safe woohoo. There's is something wrong with the games interaction, I don't have time right now to research it so I removed it for the time being. ADDED: New Woohoo/Try for Baby locations with the Get Famous Pack<--I forgot to add them the first time. Patch Update: 6/19/18<--There was a lot of changes dealing with the new seasons pack, especially for the romance category. If something doesn't seem right after seasons comes out, please let me know since they can't be tested till after the pack comes out. FIXED: If you don't have the "sims LearnInfo" Add-On, those nosy townies shouldn't be learning about careers or traits. PATCH: 03/08/18 Updated for the Jungle Adventure Pack. FIXED: Woohoo and Try for Baby should no longer reset your sims. Let me know if one does just in case one was missed. REQUESTED: That deep conversation lets sims learn about each other. This is packaged separate because you will get a notification about townies learning as well. FIXED: Bat woohoo now works. ADDED: Personality Please! Cats & Dogs<--This is in TESTING Read spoiler for more info. FIXED: Offer Rose in the restricted version should now appear after becoming friends with a sim. FIXED: Personality Please Woohoo/Try For Baby has been fixed. For some reason after the patch Try for baby on the bed did not work. FIXED: All woohoo & try for baby custom interactions have been fixed. CHANGED: Interactions: Fight, Throw Drink, Insult<--Just adjusted their levels to see if I can get these to happen a little more often. REMOVED: Confess to cheating<--I couldn't find this anywhere in the game's XML files. I believe it has been removed from the game. CHANGED FLAVORS: All Woohoo and Try for Baby has been moved as an addon and is no longer with the base mod. See below for more details. FIXED: Woohoo and Try for Baby not showing up when they were supposed to. FIXED: Woohoo animations have been fixed. More romantic ones for the responses will be coming soon! FIXED: All romantic interactions will now appear if a sim is engaged or married. Prior, if those sims were together before the mod, the interactions were locked out. CHANGED: Woohoo and Try for Baby's restrictions have been adjusted. REQUESTED: For romance not to be set quite so high on when it will show. More details below. REQUESTED: "Ask about Career" is currently no longer autonomous till I can get rid of the broadcaster. FIXED: A couple of woohoo locations have been fixed. REQUESTED: Ask if Single is now in the friendly pie menu. Will NOT give you romantic relationships or cause jealously! CHANGED: The Trait "Hates Children" will reject a request for "Try For Baby"
CHANGED: Adjusted "Yell At" and "Insult" a little higher. They didn't seem to be doing it when they should of been. FIXED: Now compatible with any of my socialization tunings. If you do not have that mod you don't need to update. This is the only change. Nothing was added or removed. REQUESTED: Flavors Changed, added AddOns. See Below for details. ADDED: New Flavor that has the original gender preference. REMOVED: Removed the interaction "Ask on Date"
This does not requre Parenthood or Vampire Packs. If you do not have those, then those interactions or adjustments WILL NOT be in your game. Things you will find in this mod: <--Will also include any new items I'm currently working on for the next update. Most of the romance is restricted till higher romance levels. Cats & Dogs with Personality! I have been asked about the Ask if Single on why in the top right box it says: "[Player Sim] learned that [NPC Sim] is married to _______" I've taken a look into the interaction. In this mod it doesn't change what the sims learn on who they are with or if they are single. This coming up is a glitch with the game strings. I can take a look more deeply into to see if something in the string is wrong but I can't guarantee I will get it fixed but I will look into it. If I get it fixed I will post an update for it. Another thing that has been brought up a few times is the mischievous interactions happening to often. This isn't something that happens in my game however, I have spoken with several on this issue and each one it came down to one thing. MCCC's tuner interactions. I have no idea why this is making the interactions happen so frequent but when a certain interaction in that module is turned to "Enabled" for some reason with this mod it is causing them to happen excessively. The only thing I have found that fixes that with out removing the Tuner Module, because I use it as well, is just turn the interaction that's causing the problem back to "Default"
This mod is a work in process. What does that mean? Means more additions could be added at any time so check back often! For example: Pets. After that pack comes out I plan on playing around with it and maybe a new add-on will be created specifically for pets just like it was for our lively toddlers! This mod is going to add excitement to your game! I removed the idle chat that sims used to do. What that was, was sims would randomly go up to someone and just "Chat". Just like it says. The sims learned nothing. They did nothing that was from their moods or traits. By removing the idle chat, sims now choose an actual interaction. Now they will ask about day, kiss, tell jokes, be mean. Your enemy sim at any given time could come up to your sim and beat you up! Interactions are based off of several factors. If a sim is evil they are more likely to do mean interactions or if they are romantic they like to choose romance over mean interactions. Their moods will play a factor in how the sims act. If they are extremely mad they are bound to yell at anyone and who ever near by. They are less likely to do friendly interactions during a hostile moment. All interactions used are listed under their add-on or flavor. Common Questions: <--Please read before asking a question. Will you do any more flavors of the orignal mod? No, This mod is way to large to keep making flavors and then having to keep them updated. Refer to the XML Spoiler to see the size of this mod. A sim keeps rejecting my proposal to try for baby. Why? Check the traits, if a sim has the "Hates Children" trait they will reject. They will do regular woohoo so if you have a Risky Woohoo those sims may accidently have children. What happened to the romantic pie menu! most of it's interactions are gone! 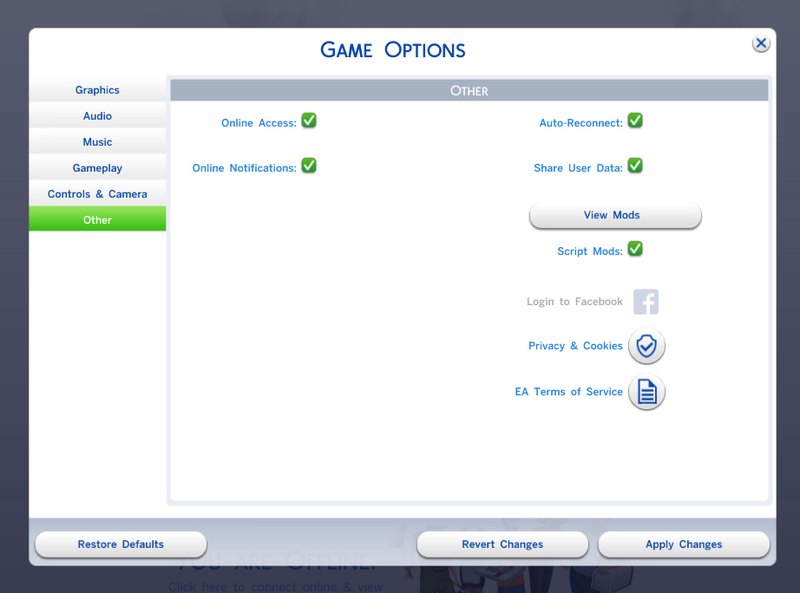 If you have the Restricted Romance Add-On then the pie menu is restricted till sims are friends. A few interactions, however show up because of certain moods like "Flirty" or "Confident". What happened to Woohoo? Its not in the pie menu! If you have the Woohoo/Try for Baby Add-On, it is restricted till sims have a certain relationship. Please check the Woohoo Spoiler below for more details. Try for Baby isn't happening! Please check the Try for Baby Spoiler below for all Try for Baby questions. This mod is designed to give your sims more of a personality. And what I mean by that is a large number of interactions have been modified to be autonomous along with changes with how and when they are used. Are these the only interactions going to be added in this mod? No. Because of the large amount of interactions and the amount of time it takes, I will be occassionally adding more interactions either by my choice or by requests. Why isn't an interaction in this list happening? None of these interactions are set as a guarantee. I think an interaction is happening to less/often. Thank you for letting me know. I can take a look at it, let me know your sims traits, their conversation they were having, their mood and what kind of relationship did that sim have with the other. Is it possible to have different flavors? No. This mod is filled with interaction files. More flavors just means several hours tweaking each file to suit that flavor. Sorry, I'm just not going to spend days creating 1 flavor. Will these conflict with any of your other mods? No. Any interaction used in any of my other mods are adjusted so they will not conflict. An interaction just happened autonomously that isn't listed here. Why? Because I disabled the Idle Chat, Sims will now do a lot more autonomously that was already in the game. Since this mod is not a script mod, in-game option menus isn't something I know how to create. So instead I have went with Addon's. Any of these can be added to the main mod or used by themselves. With this Add-On, most of the romantic interactions will be restricted. There will be a few that will be there all the time to get you started. Once the sims start getting a higher romantic level more interactions will start to appear. This is a custom test that the game will preform. This should NOT conflict with any other mod since this is a custom XML that I created specifically for this test. This does NOT conflict with MCCC Woohoo Module. If you do not use this Add-On the romantic menu will appear just as it does in the Vanilla game. Just like before, the restrictions to this menu is designed to help lower and limit the amount of cheating that the sims will autonomously do. With out this Add-On, there is a very good chance your sims and sims in the area will cheat on their loved ones. Any special mood interactions like "Bold Pick up Line"
Sims Learn Info<--This can be used separate or with any of the Add-ons or flavors below. I had a request that would allow sims to learn some info about other sims when they had a deep conversation. So what I did, because I know not everyone wants to see the notification at the top right hand corner each time a sim learned a trait or a career, I put this in as an Add-On. Can the notification be set up for just the active family and not with all the townies? No, from my research this is hard coded into the game and can not be changed. CHANGES: When I first created this portion of the mod it used the loot actions that were already in the game for the sims to learn the careers and traits. Since the changes changed the vanilla game's percentages that effected the other interactions that would allow the sims to learn the traits or careers. For example: I set it for sims to learn the careers by a small percent, which in return made it where using the interaction "Ask Career" to also only have a small percentage on learning the career making it where sims didn't always learn it when they asked. I had intentions of changing this but had forgotten all about it. Thank you! c_s_w@hotmil.co.uk for mentioning this and reminding me that I was going to change how it worked. So that is what I have done that is different. This interaction now uses custom Loot actions for the sims to learn the information. Meaning the loot actions used in this add-on will no longer conflict with any other mod and will allow the other interactions like "Ask Career" to be back to learning the careers on the first ask like originally. Since cats and dogs are not playable in vanilla game with out a mod I'm unsure on how the cats and dogs are going to act with these changes. Choosing interactions wasn't easy since I didn't really know what all they could do. I do not use the playable cats & dogs mod so I do not know what the interactions for the animals were. This is only in testing because there may be changes in the future. Let me know if something isn't happening enough, or to much. With your feedback on this Add-On will help make this portion better! Some interactions were already autonomous while others weren't. Not sure the point if they weren't autonomous when we couldn't play the pet in the first place. Anyway, all interactions are set to autonomous, the odds of choosing the interactions were raised along with the cats and dogs traits, moods and relationship with each other and sims to also help decide if the interaction is used. What I'm hoping to see with this Add-On is that animals actually interact with each other. I have played a little with cats and dogs and all I ever see is them wondering the areas. I don't see them interacting with each other. They don't play with cats or dogs outside of the family. I found this odd. There should be interactions happening whether they are fighting or playing it should still be there. So I'm hoping this will help encourage animals to interact with each other. This has nothing to do with breeding! At this time I am very unsure on what codes actually do this in the game, there was several and with out knowing what the interaction actually says in game, its kind of a guessing game. At least for me it is. There is several interactions for this Add-On. They are listed in the XML spoiler and will be at the bottom, I always add new XML's to the bottom of the list in all of my mods. Interactions for this one consists of pet to pet, sim to pet, pet to sim, and solo. I have the categorized below under what they will fall under. If you want any more added, just let me know what interactions they are and why you think they need to be added and I will take them into consideration. There is no guarantee that any interaction will be added, I'm not out to change every interaction in the game. I have added Personality just like in the main mod to these as well to help get them to be used appropriately. Do NOT use this if you are using MCCC's no strings option. They conflict with each other. I have placed restrictions on these interactions. Woohoo needs to be boyfriend girlfriend or higher to appear along with conversation. Try for baby needs to be engaged or married to appear. I did this to help with the excessive baby issue. I also changed the animations used. The sims will no longer act like their cheering for a game but instead act more romantic. Different locations have different animations. MC Woohoo DOES increase the Woohoo frequency. I added a setting that allows the user to specify a "time-out" that will occur between Sims having Woohoo to help slow them down a bit...otherwise, they might never get anything done! Those changes were made quite a ways back after EA broke Woohoo so Sims were going crazy with it and then knee-jerked it back to hardly happening. As an aside, in the near future, I will probably remove that code as it is right now and will be implementing a setting so that may interact differently at that point with default settings and the way it is working with your mod now. I have removed my mod to see how the game used woohoo and it was always there and you could woohoo with who ever you wanted after an introduction. To me that's only usefull if your using a mod that allows you to be paid for your woohoos. I don't play that way and prefer my sims to at least be romantic in some way or another first and wasn't to thrilled of anyone wanting to woohoo with my sim just because they had met. Which means if you use MC Woohoo and this add on your sims will go at it like rabbits.<--Don't say I didn't warn you! As of right now, only the pie menu Woohoo option is effected by this mod. Clicking on the object for woohoo will be coming in future releases! Locations Affected by this Mod:<--Let me know if I missed any! I also hope to hear back from you as well on how the sims are handling the new adjustments. Because I personally didn't want sims trying for baby just because they were just starting a romantic relationship I decided to restrict this interaction. Sims will need to be bf/gf, engaged, or married for this interaction to appear! Why is the sim rejecting this interaction? As of right now, only the pie menu Try for Baby option is effected by this mod. Clicking on the object for woohoo will be coming in future releases! Toddlers!<--This can be used alone, or with any gender preference add-on or the main personality mod! I made this portion of the personality mod to be an add-on because maybe not everyone would like to have more personality with their toddlers. They are already a handful as it is expecially if you have the parenthood pack. This does not require the parenthood pack. Eventually I plan on including some of the new interactions and such from the parenthood pack in with this mod. While playing the game here lately I have noticed that nothing really says what toddler, when or why they do certain things. They seem like they're a little confused with what personality and mood they are. There was a reason for this! Most of the interactions listed below didn't have anything in the codes saying anything about the toddlers traits, moods, relationships or conversations! I decided to go in and write in the new codes for all of this for our lively todders! So hopefully now your toddler will act more like their moods, traits, and be based off of their relationships with the sims along with the type of conversation they are having. This is a WIP because it will take time to see how the toddlers will react. This may take seveal adjustments to get our toddlers where we want them so I am asking for your help as well with this add-on. Let me know your experiences with the toddlers after playing them for a while. Let me know if they seem to have more personality and if it fits with what is happening at that time with them. Also let me know if they can't do a certain interaction as well. Thank you for all of your help! Requests for interactions are welcome but no guarantee they will be added. There is a lot of time put into each of my mods and this one is the most time consuming to work on so interactions will be added if I agree with the suggestions, feel like adding them, or think there is another that needs adjusted. This is where all the magic happens with this mod! This is the original mod so all the change logs above will be included in this mod. This is designed to help keep sims from cheating with sims they don't know and help control the amount of flirting that happens among sims who don't have a relationship. This does not stop sims from cheating, though, but will decrease it. Read the WIP above for info on how this mod works. Interactions:<--I plan on adding to this list when I either, get a request, feel like it lol or find something I feel needs changed. The romantic pie menu is set back to Vanilla settings. If you want it restricted like it was before this version, use the Restricted Romance Add-On which no longer conflicts with MCCC Woohoo Module. Some of these were hard to decide on how they should be used. If any of the mischief ones don't seem to be used right please let me know. If the clog drain interactions aren't happening autonomously let me know. I can add in moods, relationships and traits to them to help get them happening appropriately. Alien Erase Memory<--Don't worry, its set to hopefully not happen to loved ones Just don't make them mad..........!!! Dare to Streak-Mischief but may not happen with sims who are in negative moods, conversations. Good sims probably won't ask but Evil, Childish and a few other traits will. Confess To Cheating<--Removed. I couldn't find the XML codes anywhere to update them. Not sure if it was removed from the game or not. If you have any suggestions on what interactions are used when a sim is playful, please let me know. These are going to be hard to adjust. I am ok with some sims dying from laughter but I don't want it to be excessive. Please let me know your experiences. Any mod that changes the same XML files will conflict!